Friends, this cold and flu season has been pretty brutal for us. What about you guys? Since the beginning of December we have had sickness after sickness! If not my husband, my son. If not him, me. And so on. Sometimes the illnesses even overlapped. That was fun. So here we are, just ending our third round of my son having yet another head cold. The last two (one in December and one just last month) resulted in ear infections, so honestly, I was pretty worried. I felt like I was pretty prepared each time the cold and congestion hit, but those two other rounds actually left myself feeling like I just didn't quite catch it. So here, during round three in 3 months, I think I've got this figured out. Wouldn't you know, after instilling this new and improved little guy protocol, this bout lasted WAY less and didn't end up in an ear infection like the other two! Here's our new cold/cough/fever/head congestion protocol for littles (toddlers)! Each time another cold hit us, I used less and less of the medicines you'd find at your local pharmacy and created a new holistic/natural remedy to replace. Instead of Tylenol/Motrin, I created an essential oil roller bottle. Instead of cough syrup or cold medicine, a decongestant essential oil roller. Et cetera. I focused on also healing his whole body and building his immune system as a whole instead of just treating the specific symptoms. Although I also attacked those pesky symptoms as well! We also focused on detox baths, supporting his gut health, and overall immune system health! Here's what we do now whenever our little guy gets a cold! This was the last thing we found and tried (and loved)! I swear to you that this is not only the weirdest thing yet, BUT also worked the best. His first day sick this last round escalated quickly. By nighttime he spiked a pretty high fever and looked miserable. Just like the last two times. 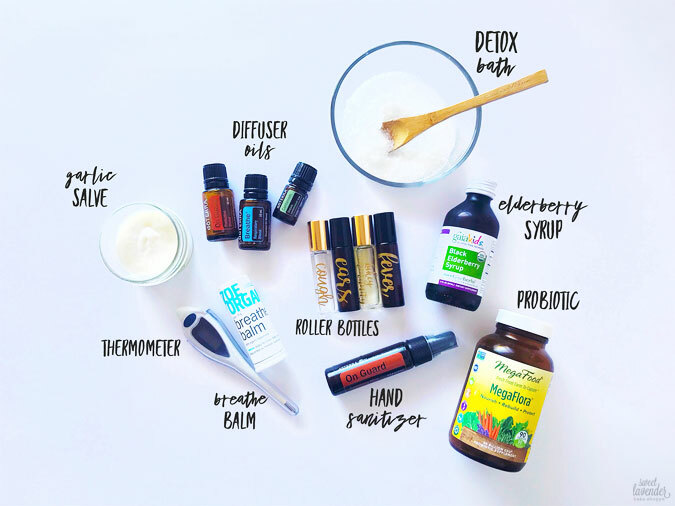 I ran to the kitchen while my husband was in the bathroom with him, taking a lukewarm bath, whipped this concoction up, rubbed it on his feet, put socks on and HE WOKE UP THE NEXT MORNING 90% BETTER! Shocked me! Simply blend 1/3 cup organic coconut oil with 8 organic fresh garlic cloves and 10 drops therapeutic grade lavender essential oil until its a smooth consistency. Place into a glass jar and rub a little bit on the bottoms of their feet 1-3 x a day. Place socks on right away. We just do this before bed and after his bath where he won't be walking around and his pores are opened up from the warm bath water! Store in the fridge for 7-10 days! Or share with friends! This is amazing for congestion and respiratory support! Essential oils diffused throughout the house is a GREAT way to not only affect everyone in your house easily, but its an amazing way to get the benefits of essential oils into little ones' immune systems! PLUS when they've got a cold, this is a great way to help them breathe better and break up congestion! The humid air mixed with the therapeutic grade essential oils is our number one go to for beating colds in our home. We have one going in our living room and his bedroom almost 24/7 whenever he's got a cold (or is sick in general). Here is the diffuser we have AND LOVE. For colds and congestion as well as general immunity boosting, we alternately diffuse a combination of dōTERRA Breathe and Cardamom and then dōTERRA On Guard. Breathe mixed with Cardamom is going to support his airways, respiratory system and beat congestion and On Guard is going to support a healthy immune system! For a full diffuser (400-500mL) we do 2 drops TOTAL of essential oils for his bedroom and 8-10 drops TOTAL for our living room. Every night we give Lukey a lukewarm to warm detox bath when he's sick or has a cold. The essential oils change depending on what he's fighting, but the epsom salt stays the same. Epsom salt is such a great and natural way to help aid his body in eliminating those toxins circulating around his system, soothes sore muscles, and is a great calming agent. For colds we like to mix 1/4 cup of epsom salt with 2 drops On Guard and 2 drops Lavender. Or we'll mix 2 drops On Guard and 2 drops Arborvitae. Or even 2 drops Lavender and 2 drops Melaleuca. I just sprinkle in a few tablespoons into his bath water, swoosh it around and allow him to soak (and play) in it. Store in a glass container or jar. I do this every night until the epsom salt mix is gone. I'm sure this one is no surprise to you. But it's a must for any illness you or your little is going through. We have this in both kids version and adult, but you could just buy the adult version and give according to the instructions on the box. We picked ours up from our local health food store. Elderberry syrup is known for its immune support and Gaia Herbs' version is made from certified organic back elderberries and added acacia honey. It's amazing in supporting little ones' immune systems and the honey is tasty and soothing to the upper respiratory system. Their formula contains no artificial flavors or colors, no preservatives, and no high-fructose corn syrup. We adore it. Probiotics should be taken every day by adults and kids alike in general for gut and digestive health, but definitely when someone is trying to fit off an illness. Did you know the heart of the body and immune system stems from the gut? It's true. A healthy digestive system and gut gives someone a much better chance at fighting things off than someone with a leaky/unhealthy gut or unhealthy digestive tract. So we all take this particular brand daily, but DEFINITELY when an illness is roaming around! We just get it at our local health food store. I'm sure no one is surprised by this one either but it's worth putting out here. We have a bottle of this with us almost everywhere we go. Blow Luke's nose? Spray this. Help him go potty, get a drink, get dressed, etc while he's sick? Spray spray spray. Him. Me. My husband. We spray everything! I love this dōTERRA On Guard Sanitizing Mist because not only does it kill germs naturally but because it has actual On Guard essential oil inside, it's also boosting all of our immune systems every time we use it! Plus because everything inside is safe and natural, I'm not afraid of it being on my little guy! I have a million of these made. 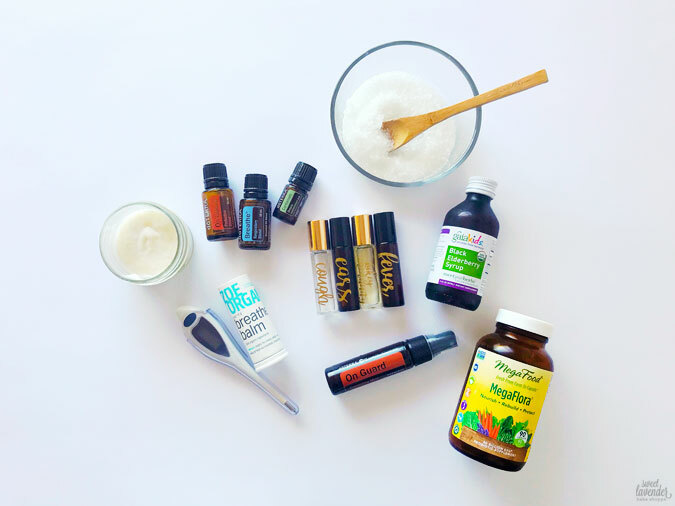 It's been my mission over the last year to slowly take an over the counter or prescription medication out of our medicine cabinet and replace it with a roller bottle made from therapeutic grade essential oils. Rollers are a great, easy, and convenient way to support and address medical conditions naturally! Just as easily as one might go in to get some Tylenol or allergy medicine, one can go and grab their "headache" or "allergy" roller bottle. For little guy colds I have and use a Cough, Ear, Immunity, and Fever roller bottle blend. Cough- in a 10mL roller bottle add 2 drops each of cardamom, lime, frankincense, marjoram and breathe dōTERRA essential oils. Top with fractionated coconut oil. I roll this on his chest and upper back every 2-3 hours. Ear- in a 10mL roller bottle add 2 drops lavender, 2 drops melaleuca, 1 drop frankincense and 1 drop basil dōTERRA essential oil. Top with fractionated coconut oil. I apply this as a preventative because he's susceptible to these, as soon as I notice he's got a cold. I roll this around the outside of his ear every 2-3 hours. Immunity- in a 10mL roller bottle add 2 drops frankincense and 2 drops on guard and 1 drop each of melaleuca, oregano and lemon dōTERRA essential oil. Top with fractionated coconut oil. I roll this up his spine, and bottoms of feet every 2-3 hours. Fever- in a 10mL roller bottle add 4 drops each frankincense, lavender and peppermint dōTERRA essential oils. Top with fractionated coconut oil. I roll this up his spine, across his forehead, on the back of his neck, bottoms of feet and around his belly button every 2-3 hours. We use this as a natural vapor rub to help him breathe easily and remove any congestion. Simply rubbed on his chest, back and bottoms of feet as needed. I love the Zoe Organics brand because they use all natural and clean ingredients! We check his temperature at least 3 times a day to keep monitoring his fever progress. Still hot? We rub on more fever blend roller bottle, undress him more, and/or lukewarm bath, etc. 10. Not Shown: Lots of Fluids!!!! We hydrate like crazy to not only keep him peeing and detoxifying but also to help decongest him! We love plain water, coconut water (100% coconut water like Zico brand), and 100% organic juices like orange, pineapple and mango, diluted with water or coconut water! These are the best way to get Luke to continue eating healthy. Not a smoothie fan? Make these into homemade popsicles! We pack ours with greens (like spinach or kale), and antioxidant rich fruits like berries! Also a must? Collagen Hydrolysate! It helps the gut and is a great protein source! I so hope this blesses someone out there and give you hard working mamas and daddy's peace of mind! Believe me, I know what it's like to WHAM out of nowhere have a little guy sick as a dog and you feeling totally ill prepared! I hope our experience allows you out there to fight your next cold with confidence! *I am in no way claiming to be a medical professional. I trust you as a mama and dad will trust your gut and do what's right for your family. This is not meant to replace medical intervention by any means. Please consult your doctor! This is simply what we use in our family and what works for us. This blog post is intended to be an inspiration for families across the globe!